Funnily enough Vestfold is not only the smallest region in Norway, but also the most densely populated one. While there are some natural attractions in Vestfold, people mainly go to this region because of the culture, art, sculpture, heritage, and architecture. 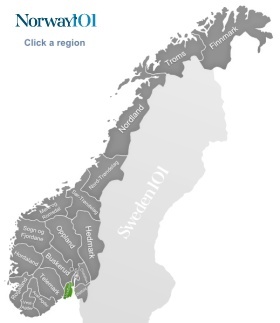 It is also one of the best and most productive agricultural regions in Norway. Vestfold is also known for fishing and sailing, as there are mainly lovely islands that can be explored on a boat, and of course the region also makes fishing very enjoyable and yields good results. The main attractions in this region are galleries, museums, cultural landmarks, architecture, and sculpture – so if you are looking for a culture overload, then this is the right Norwegian region for you – and because it's such a small region, you'll also be able to easily see a lot within just a short time. It is believed that the first town of Norway was in Vestfold (Kaupang). The oldest still surviving town in Norway, however, is Tonsberg. It was in Vestfold, where some Norwegian kings (as there were many at the same time in the past) decided that it was time to unite Norway, so the country would be a stronger unit. Invasions from other countries were making them nervous, and they knew that one strong kingdom would stand better chances than many small kingdoms that were fighting against each other. Harald Fairhair came from this region, and historians think that he was the first proper Norwegian king. Vestfold is also home to one of Norway's most interesting landscapes: the largest rolling stone beach with the name of Mølen. The landscape in itself is already fascinating enough, but add to it the historical importance: There are well over 200 cairns on this rolling stones beach. Some of the cairns have a diameter of up to 35 meters! The smaller cairns are most likely the tombs of the crew of a ship that stranded in the area, while the larger cairns were the tombs of more important people. In one of the cairns, archaeologists found burnt stones, so it is assumed that people at that time did cremate their dead. Some of the cairns could be from the Bronze Age, while most of them date back to the Iron Age and the Viking times. Since 2008, the area is also a UNESCO Geopark site. Historical Borre is a place where you can see some barrows (some big ones and more smaller ones), and if you believe legends, you might want to turn up in the early morning hours. Maybe you will hear the elves playing some sad tunes. This is quite a magical place, and you will find that there are plenty of beautiful legends (and some disturbing ones, too) around this area. There are many charming villages and towns in Vestfold, but Sandefjord might be worth a closer look. The town has a very old and well preserved residential area with wooden, white houses from the early 18th century. This was an area in which many traditional craftsmen used to live, and they were often joined by sailors. In some areas, you can also see the remains of some older shops. The Bronze age carvings at Haugen are another sign about the historical importance of this small, but fine region of Norway. The carvings were produced some time between 1500 and 500 BC. Unfortunately this is the kind of place that you can only reach if you have your own transport. Tønsberg is a good place to visit, and use as a base, as there is a lot to see and experience. One of the most fascinating places is called Farmannshaugen. It is a royal viking burial place. It is most likely the burial site of King Bjørn Farmann, who was killed by his own brother in 933 AD. Tønsberg also has plenty of other historical sites for you to explore, a museum, and also a charming town center. There memorial hall for sailors just outside Stavern is a lithic memorial for sailors that have fallen in the two world wars. It resembles a beacon to light the way for them. While it is not a huge tourist attraction, it is still important enough to attract around 15,000 visitors a year. While other regions in Norway have many examples of Stave churches, Vestfold only has one stave church left: the Høyjord Church. The chancel of the church is the oldest part and stems from the 12th century. Other parts are from the later 13th century. The drawings of ships inside the church are even “younger” and have been drawn during the 14th century.